LD Tyler Trofatter Lights Jorja Smith’s North American Tour with 4Wall Entertainment | Press Center | 4Wall Entertainment, Inc.
Los Angeles, CA- Following her Coachella debut in April, British-based R&B singer Jorja Smith hit the road for a North American spring tour which included a U.S. television debut on ABC's Jimmy Kimmel Live. Lighting Designer Tyler Trofatter was tasked with lighting the sold-out stateside performances with gear from 4Wall Entertainment. Discussions between Trofatter, UK Lighting Designer Frankie McDade, and Tour Manager Simon Parkinson commenced in early February. "Franki had put together some original design concepts for the shows in the UK that were a mix of headlining shows, festivals, and award shows that ran in February and March," explained Trofatter. "The goal of the design was to give the show somewhat of a vintage, homey feel that could then be ramped up into larger looks." A dozen 40w vintage filament bulbs hang from single pendants at various heights around the stage along with a crimson red cloth backdrop that lends itself to a cabaret type of setting. To contrast the vintage feel of the hanging bare bulbs, 4Wall provided the LD with Martin Professional VDO Sceptrons. "The Sceptrons add a great deal of flare and subtle movement and are never used in the same song as the bulbs," said Trofatter. "The built-in color and FX macros are easily controlled and scalable to match the tempo of each song and provide just enough punch to make an impact." Martin MAC Aura XBs and Martin MAC Viper Profiles were paired together for some of the larger shows in Los Angeles and New Your City. "The Aura XBs provide phenomenal punch to backlight the band and artist, and have fantastic color control," explained the LD. "The Viper Profiles' strong output, large zoom range, great stock gobos and gentle, precise color mixing made it easy to create diverse looks in conjunction with the XBs." Trofatter chose to bring along four Chauvet Rogue R2X Spots for the bulk of the tour dates as well. "These fixtures are extremely bright and their compact size and low power consumption are perfect for this stretch of the tour," said Trofatter. "It's great to be able to power them all from one 20a circuit." 4Wall also provided one MA Lighting grandMA2 Light console for the tour. Trofatter spoke of the service 4Wall provided. "Bob Suchocki has been great with re-quotes and design changes and has gone above and beyond several times for me to make sure we received exactly what we needed," said the LD. "I'm looking forward to continuing the relationship with 4Wall for future tours." 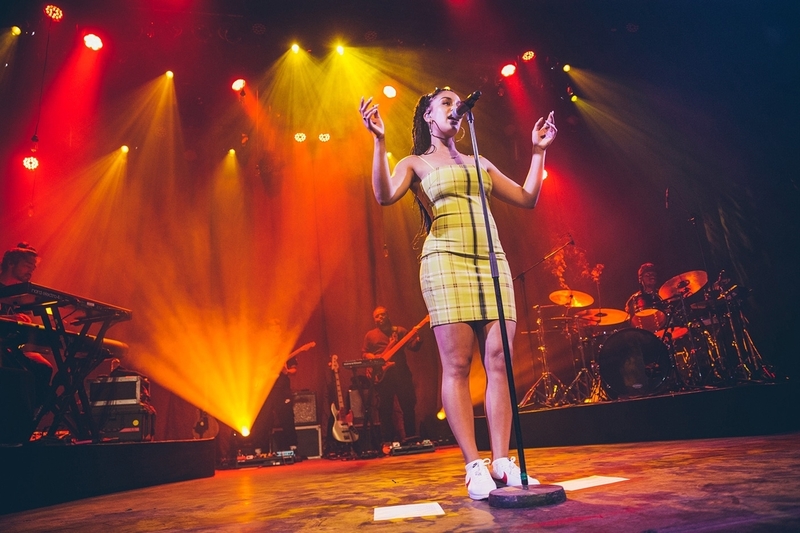 Jorja Smith has been met with sold out shows all over the United States. Her debut album 'Lost and Found' has a release date of June 8th, 2018. "The entire team from the artist to management and crew has been a dream to work with," concluded Trofatter.